Libretto was engaged to create a face and a name for the first comprehensive campaign at Salem State University – an institution with a rich legacy of creating opportunity for thousands of deserving students. This ambitious initiative was conceived not only to celebrate the University’s success as a public institution, but also to foster private philanthropic support that would enable Salem State to keep thriving in the face of reductions in public funding. After leading a discovery process that included conversations with stakeholders ranging from President Patricia Meservey to groups of undergraduate students, Libretto identified a theme – 10,000 Reasons – that reflected not only the size of the student body, but also the institution’s exceptional commitment to student success. 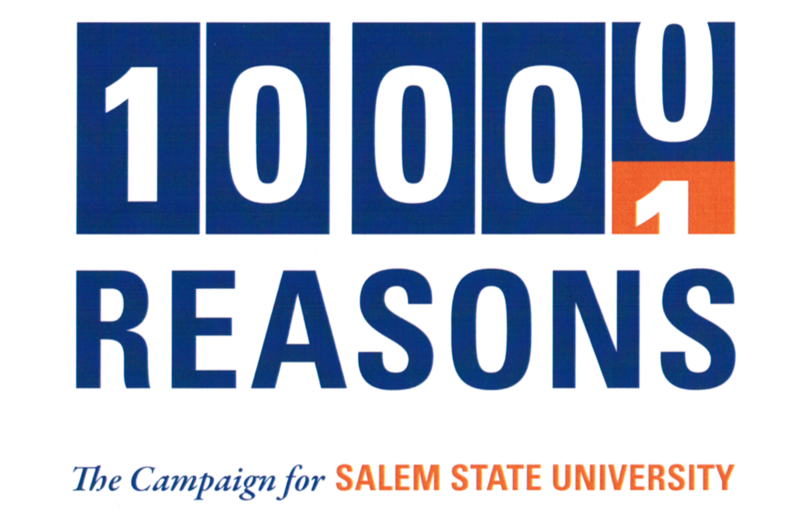 The theme drove all public-phase communications for the effort, including a website that allows community members to contribute their own reasons for supporting SSU. At the kickoff gala for the $25 million initiative, President Meservey explained, “That phrase, 10,000 Reasons, fills me with pride every time I hear it. It points directly to our student body – 10,000 stories, 10,000 hearts and minds, 10,000 carriers of the torch of knowledge – and tells me our focus is right where it should be.” Supporters at the gala were given numbers that identified them as one of the 10,000 Reasons – including Reason #604, Libretto President Neal Kane. "The Phrase Fills Me With Pride"